They may not be the standard way to get around (yet), but functional hovercraft have been around for lots of years. One of the reasons they aren’t more popular is their poor handling and turning; the hover-navigation just can’t compare to that of wheeled vehicles. Designers (and cousins) Michael Mercier and Chris Jones are doing their part to create a hovercar that is both stylish and maneuverable. 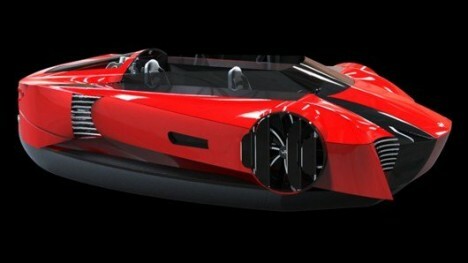 What you will probably notice first about the Mercier-Jones hovercraft is that it looks a lot like a sports car. The very sleek and modern shape seems like something you would see zipping around a racetrack. Its steering and braking systems are similar to those found in a traditional car, so “pilots” won’t have a severe learning curve when they first climb aboard. The craft’s patent-pending control system will offer as much control as that of a traditional car, but it will have the added benefit of being able to glide right over basically any terrain effortlessly. The Mercier-Jones hovercraft will be a hybrid vehicle, boasting both a gasoline engine and an electric motor. But unlike other hovercraft, this one will be quiet enough to drive without a set of earplugs. The team also wants to make the hovercraft an affordable vehicle, expecting the initial model to sell for $19,900 or less. They are raising funds for the initial production run on crowdfunding site IndieGoGo. If everything goes according to plan, the first hovercraft should start their first flights by May 2013. See more in Concept Vehicles or under Transportation. August, 2012.